British production company Granada International Television created The Adventures of Sherlock Holmes in 1983, starring Jeremy Brett as Sir Arthur Conan Doyle's literary detective and David Burke as his biographer and friend, Dr. Watson. The original series adapted some forty-six Holmes tales to television—MPI's disc (presumably first in a series) presents the first four one-hour episodes: Scandal in Bohemia, directed by Paul Annett; The Dancing Men directed by John Burns; The Naval Treaty, directed by Alan Grint; and The Solitary Cyclist, directed by Paul Annett. In the interest of preserving the reader's joy of discovery, I shall refrain from discussing the plot particulars of these four episodes. All are based on well-known Holmes stories (if you must have your spoilers) and all feature wit, deduction, violence and dark psychology sufficient to honor the name. More to the point, this four-episode DVD collection is varied and surprising enough to skirt the hazards of formula, playing more like four short movies than four episodes of an ongoing television series. The series' production designers establish a literary, pseudo-period tone that feels just right, despite a visibly low budget. Doyle's fictionalized London is brought to life with hansom cabs, guttering streetlamps, and a convincingly false sheen of social elegance, constantly struggling to hide the darker realities underneath. The teleplays adapted from Sir Arthur Conan Doyle's short stories seem faithful in tone and content without noticeable abridgement, and the lead performances are credible and fresh while following the classic lines established by Basil Rathbone and company. Brett's Holmes is sharp-witted, intelligent, unexpectedly witty and more than a little bit condescending, making for jolly good interplay with Burke's good-natured, frequently awestruck, puppy-dog-in-a-tweed-jacket Dr. Watson (who recognizes Holmes' personality flaws but doesn't make an issue of them). While supporting characterizations almost universally hew to the stereotypes long established by the genre, the show's maids and mistresses, kings and commoners all seem appropriate. In a striking contrast to most mystery series, in which the hero inevitably prevents tragedy at the last minute, The Adventures of Sherlock Holmes braves its way through Doyle's ambivalent endings, in which Holmes often arrives too late or is even fooled by his escaping quarry. This contributes to the series' most quintessentially Holmesian quality—the consulting detective is driven purely by his fascination with the science of deduction, neither shaken nor stirred by emotional considerations. He's not completely cold-blooded, but the producers do not shy away from Holmes' somewhat off-putting personal demeanor, nor his mercenary need for gainful employment; Holmes is no financially independent crusader, but a working investigator beholden to his clients rather than to any moral prerogative. The series also makes explicit (though undemonstrated) reference to Holmes' opium and cocaine addiction, inducing in the great detective what Watson terms an "infernal lethargy" between cases. It is this refusal to dress up, polish, update, extend or alter Doyle's original material in any intentional way that gives The Adventures of Sherlock Holmes its considerable integrity. By consistently returning to the well for inspiration, the show remains faithful enough in tone and substance to please diehard Holmes fans without being inaccessible to the uninitiated. Some will see it merely as a higher, more revered grade of pulp detective fiction; that's as may be, but it's good entertainment all round. Image Transfer Review: The Adventures of Sherlock Holmes is presented in the series' original 1.33:1 full-frame television format. The DVD is "digitally remastered" from original film prints, not videotape, avoiding the 3:2 pulldown common to filmed TV material as well as any PAL-to-NTSC conversion issues. Unfortunately, the amount of grain in the 16mm prints frequently confounds MPI's digital compression, leading to blocking artifacts, "dancing" backgrounds and even some color instability throughout. Dark scenes are often harder to make out than they ought to be, losing detail in large black areas of shadow. The series' low budget leads to some harsh lighting and multiple shadows in a few indoor scenes, and the programs suffer from a distracting editing anomaly, a brief image jump that occurs at each transition from one shot to another. These defects don't interfere too badly with enjoyment of the disc when all is said and done, but the transfer is well below average. Audio Transfer Review: MPI presents The Adventures of Sherlock Holmes with a Dolby Digital 2.0 monophonic audio track, ProLogic-decoded to the center channel. The dialogue is generally clear and comprehensible, helped no doubt by the actors' well-enunciated delivery. Because most of the dialogue was recorded "live" on set, the microphones pick up a lot of rustling, background hum, hiss and other noise. Music sounds a bit thin and reedy (and horrendously warbly at the end of Episode #3), and dynamic range is very compressed. The audio is passable, with a bit of bass and few seriously distracting flaws, but it's clearly dated and limited by the series' budget and production timeframe. Extras Review: MPI supports The Adventures of Sherlock Holmes DVD with 48 picture-menu chapter stops and a few related supplements. Subtitles in English, French and Spanish are comprehensive and nicely implemented, with sound effect descriptions for the hearing-impaired included on all three tracks and a few obscure British cultural references elaborated in the French and Spanish subtitles. Navigation is a bit awkward—one must access the "Programs" menu to play either of the episodes on each side of the disc, and all extra features take a one-way loop back to the Main Menu, rather than returning to the Bonus Material menu. Briefly interesting supplements include the series' three-minute television promo spot, promoting the entire series with all episodes listed; a Photo Gallery featuring a handful of publicity stills set to music; a Jeremy Brett text-screen biography and TV/filmography; and biographical text notes on Holmes' creator, Sir Arthur Conan Doyle. 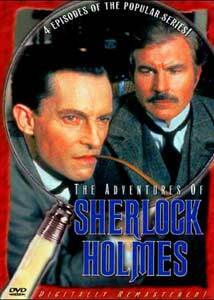 Granada's The Adventures of Sherlock Holmes adapts several of Sir Arthur Conan Doyle's classic detective stories to the small screen with great success. MPI's DVD suffers from poor video and middling audio quality, but Holmes fans will still find plenty of entertainment on this three-and-a-half-hour, four-episode disc.